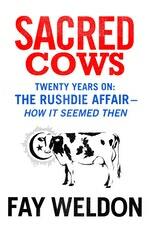 For the first time in ebook and twenty years on: The Rushdie Affair and how it seemed then. 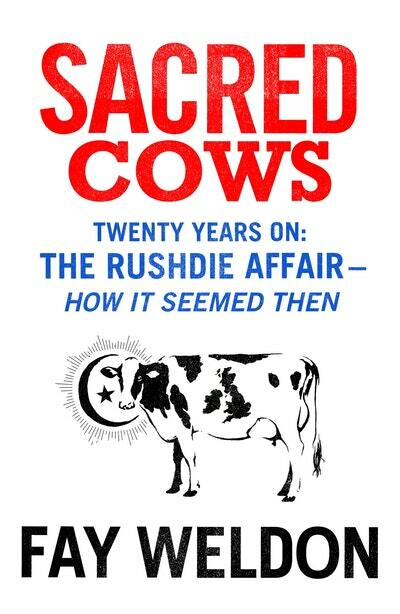 In 1989, after the Ayatollah Khomeini declared a fatwa against Salman Rushdie for writing The Satanic Verses, Fay Weldon published Sacred Cows, a pamphlet critical of the fundamentalist interpretation of the Koran. Weldon’s pamphlet received a lot of attention on publication – mostly criticism of her perceived ‘Islamophobia’ – but Weldon set out to enforce the notion that no religion should have the right to issue threats and intimidation; no religion should hinder free expression. In Sacred Cows, Weldon criticizes all aspects of British society – Murdoch and the Sun’s page 3 girls; white, liberal complacence; problems with education and the NHS – and argues that the affront to Muslim people in Britain was not caused by publication of The Satanic Verses itself but rather by the ‘awfulness of the society we have allowed to grow up around us’. The Satanic Verses is remedy, according to Weldon, to a fractured, ailing society. Publishing literature like this proves that our society ‘may yet be well and our brave new God of individual conscience may yet arise’. Originally published by Chatto & Windus as part of the 'Chatto Counterblasts' strand, this ebook edition is reissued with a new introduction by the author, as part of the Brain Shots series: the pre-eminent source for high quality, short-form digital non-fiction. Love Sacred Cows? Subscribe to Read More to find out about similar books.